Source: The Life and Mind of Oriental Jones by Garland Cannon (Cambridge, 1990), page 364. Olimpiu G. Urcan (Singapore) notes in the UCLA Library a fine photograph of Mr and Mrs Piatigorsky watching Larsen and Fischer in play (Los Angeles Times, 16 July 1966). We are seeking biographical information on Robert Frederick Green, sometime editor of the BCM and the author of a monograph Chess (London, 1889) which has been reprinted and reissued innumerable times (and even recently). The text was also included in volume one of The Handbook of Games (London, 1890). 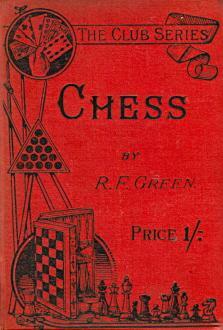 In addition, Green was the author of Solo Whist (London, 1894). Jeremy Gaige’s Chess Personalia (Jefferson, 1987) listed Green as born in Liverpool on 9 May 1856, but what became of him? 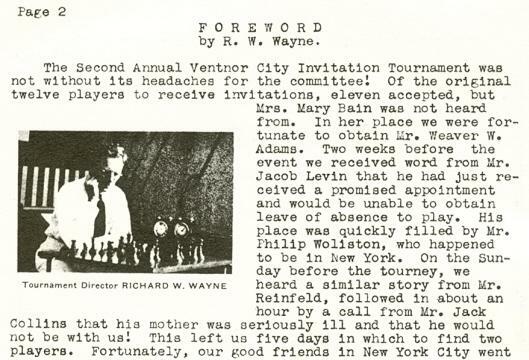 Pete Tamburro (Morristown, NJ, USA) reports that Richard W. Wayne was a director of the United States Chess Federation in the 1940s and lived in Ventnor City, NJ. He was the tournament director of the City of Ventnor Invitation Tournament (8-16 July 1939), in which Fred Reinfeld participated. A victory by Wayne against G. Ross in the 1940 Ventnor City Chess Club Championship was given in the April 1940 issue of Jersey Chess. An item by Robert Durkin on page 3 of the April 1974 Atlantic Chess News stated that Wayne was then aged 80 and ‘was a motorcycle test driver in his younger days, as well as a Sgt. major in the British Army’. This (simple) problem, from page 9 of The Austral, 25 August 1928, was given in C.N. 1198, but we are still unable to say who composed it. Does any reader know? Many writers ascribe to Capablanca the axiom ‘Good players are always lucky’. How far back can the remark be traced, attributed to the Cuban or to anyone else? 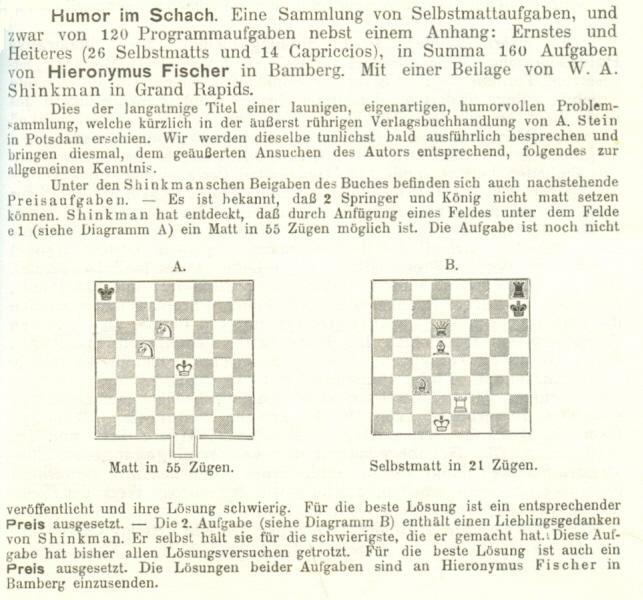 Danny Ross Lunsford (Atlanta, GA, USA) draws attention to an item on page 51 of the February 1905 Wiener Schachzeitung which relates a discovery by Shinkman that the two knights can give mate in 55 moves if a 65th square is added, under e1. To our list of writers of books on chess and bridge (J.C.H. Macbeth, Emanuel Lasker, P. Anderton, S. Novrup and M. Golmayo) we add Paul Lamford, who has authored a number of works on both games. 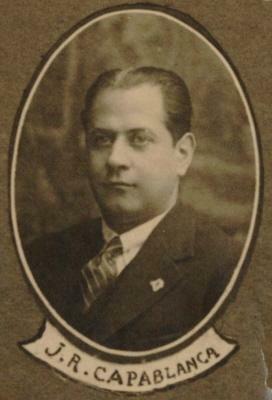 ‘Znosko-Borovskii, E. A. “Bashennyi teatr,” Apollon, no. 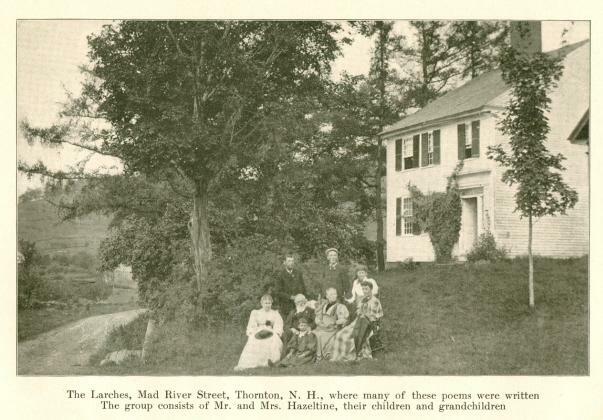 8 (1910). 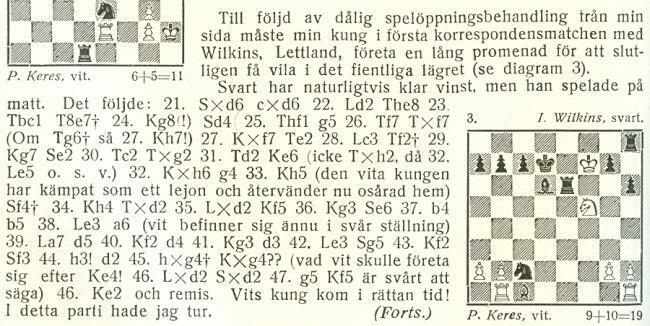 A very similar feature was published on page 7 of the June 1897 American Chess Magazine. ‘In fact, an extended notice of our old friend would almost necessitate an autobiography of ourself, for our earliest recollections of the game are associated with his pleasant instructions at the odds of a queen, and the boyish pride we felt when he finally passed upon our first problem as worthy of publication. Our old intimacy has survived the various degrees of reduced odds, until the question of strength would be decided a shade in our favor, and the master submitted problematical questions to the judgment of the pupil. Another of her poems had appeared on pages 182-183 of the New York, 1880 tournament book: ‘To the Knights of the Fifth American Chess Congress by Mrs H. Bryant Hazeltine.’ It was reproduced on page 147 of Thomas Frère and the Brotherhood of Chess by Martin Frère Hillyer (Jefferson, 2007), and page 149 presented a portrait of her, dated 1860. 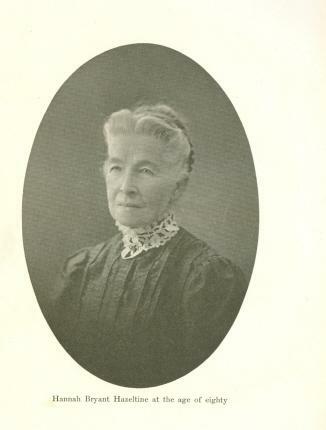 The book gave her forename as Harriet rather than Hannah. 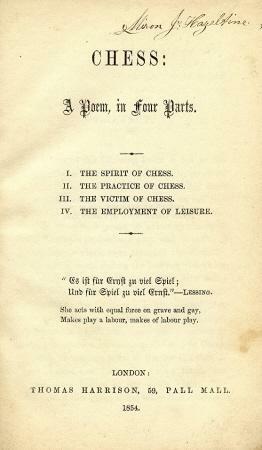 The above poem ‘A Winning Game’ was published, together with seven others on chess (‘An Enigma’, ‘Check-Mate’, ‘Chess Teachings’, ‘Chess Similes’, ‘My Problem’, ‘Caissa’s Field of the Cloth of Gold’ and ‘The Final Game’), in the very scarce book The Poems of Hannah Bryant Hazeltine (Concord, 1910). 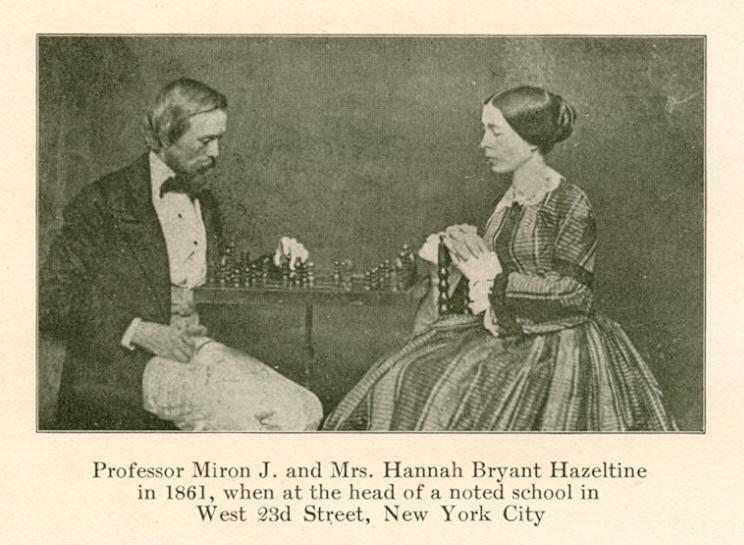 When about 19 years of age, in a literary society of which they both were members, Miss Bryant became acquainted with Miron J. Hazeltine, whom she afterward married. Being possessed of a good degree of poetical taste, Mr Hazeltine became interested in his wife’s intellectual pursuits and was of great assistance to her in some of her literary endeavors. Gerd Entrup (Herne, Germany) raises the wider question of the earliest occurrence in play of the general ideas behind the Benko Gambit (not necessarily in the first few moves). 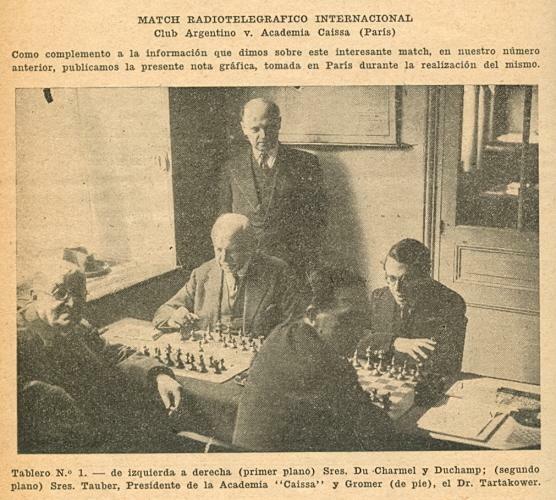 He proposes Marshall v Réti, New York, 1924, which was annotated on pages 37-40 of Alekhine’s book Das Grossmeister-Turnier New York 1924 (Berlin and Leipzig, 1925) and on pages 18-20 of the English translation. 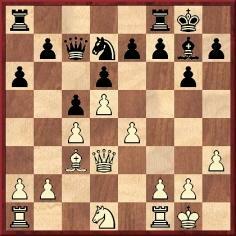 The game continued 18 cxb5 axb5 19 f4 Nc4 20 Bxg7 Kxg7 and was drawn at move 50. ‘They’ll Do It Every Time’ by Dirk Jan ten Geuzendam (New in Chess 2/2008, pages 8-29). Further to C.N. 5457, Tim Bogan (Chicago, IL, USA) comments that if ‘general ideas’ is taken to mean that Black sacrifices a queen’s-side pawn for pressure on the opened files, the game Nimzowitsch v Capablanca, St Petersburg, 1914 may be regarded as an early model. 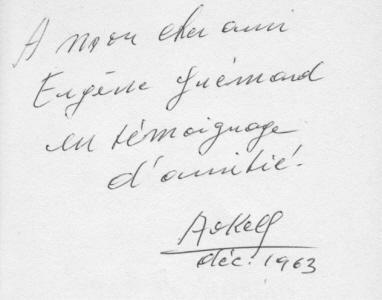 We add that Alekhine made a similar point about that game (describing it as ‘sensational’) in his notes to van Scheltinga v Opočenský, Buenos Aires, 1939. 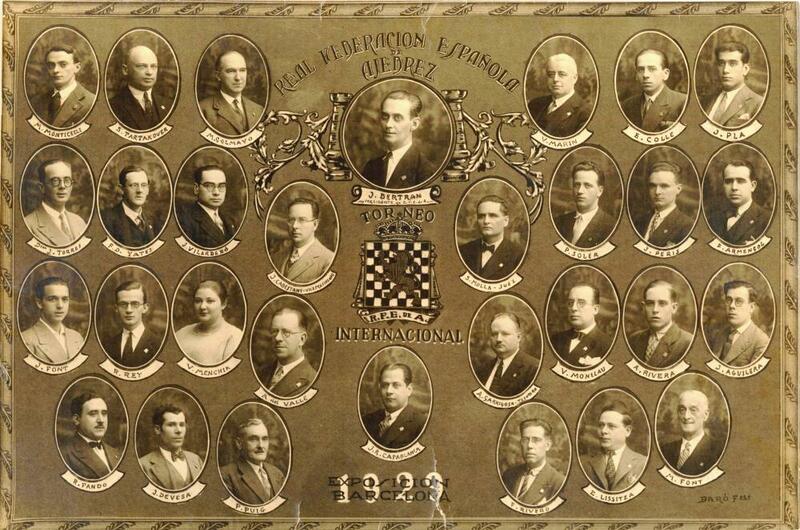 See pages 165-167 of Gran Ajedrez (Madrid, 1947) and pages 200-202 of 107 Great Chess Battles (Oxford, 1980). What is the original published source of the apotheosis? Hayden ignored that information when his article was anthologized on pages 155-158 of Cabbage Heads and Chess Kings (London, 1960), leaving it to Harry Golombek to point out Rose’s subsequent academic career in the Foreword (page 7). Brad Dassat (Oldham, England) notes that biographical information about R.F. Green was provided by John Saunders on pages 204-205 of the April 2005 BCM. On the basis of the National Probate Records index the article reported, in particular, that Green died in Algiers on 25 January 1925. 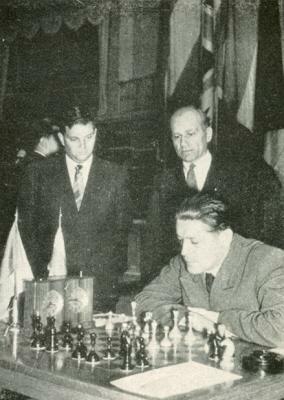 See too our updated feature article Early Uses of ‘World Chess Champion’. 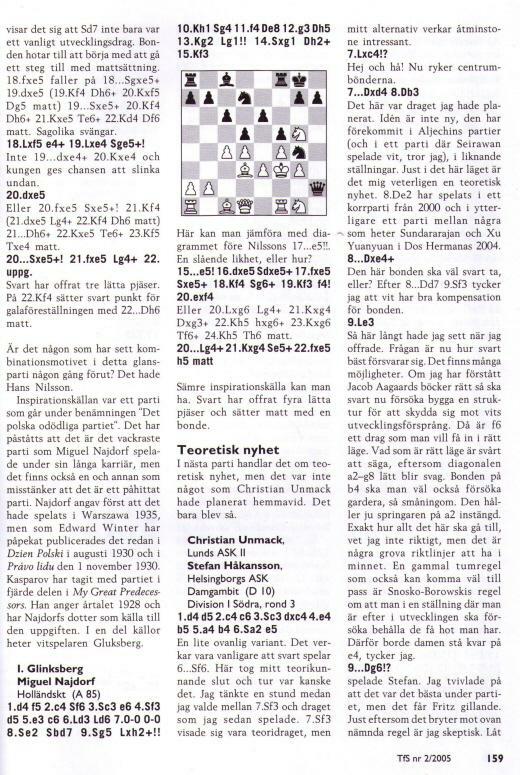 Below is an article from page 11 of our publication Chess Characters by G.H. 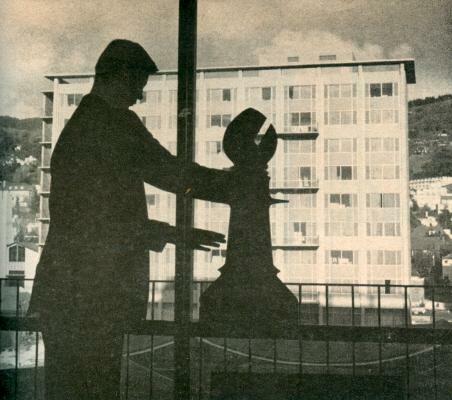 Diggle (Geneva, 1984). 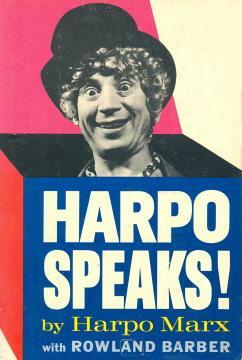 It was originally published in the May 1976 issue of Newsflash. ‘Many eminent authorities (Richard Réti, Dr Lasker, Dr Euwe and C.H.O’D. Alexander) have written learnedly on the subject of Development of Chess Style. Much could be written on the subject of development (and constant changes in fashion) of the style of chess annotation. Broadly speaking, it is not unfair to say that our forefathers’ notes to games were “all style and no content” – for example, “Once more this unfortunate knight is driven bootlessly back to his old inglorious post” (Staunton) leaves the student quite as “bootless” in his search for enlightenment as the unfortunate knight in his quest for glory. This century, on the other hand, has produced notes of more content but not always much style – some modern annotators, though accurate and profound in their analysis, seldom produce any phrase totally unlike the last one. “A serious tactical error” – “A strategically incorrect appraisal of the situation – he gains some material by tactical means, but at the same time presents Black with some thematic counterplay”, etc. etc. etc. What event is depicted in this photograph? Petrosian: the Weltgeschichte des Schachs volume by E. Wildhagen (Hamburg, 1963) and Tigran Petrosian: campeón mundial de ajedrez by L. Palau (Buenos Aires, 1963). Korchnoi: El estilo tenaz de Victor Kortchnoi by H.L. González (Córdoba, 1968). 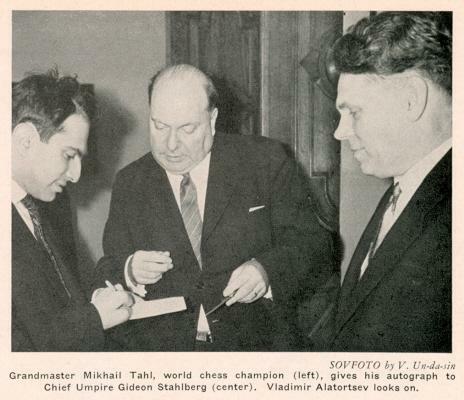 We add that the Wildhagen book was published before Petrosian became world champion (it being briefly reviewed on, for instance, page 118 of the April 1963 BCM). 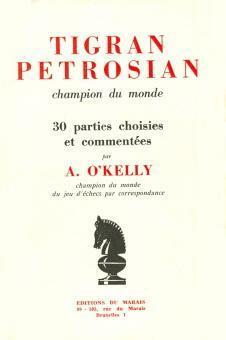 Another early volume was Tigran Pétrosian champion du monde by A. O’Kelly (Brussels, undated, but 1963 or 1964). 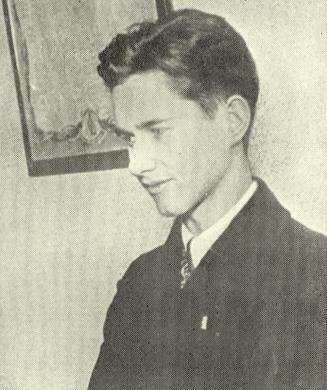 John Bleau (Quebec, Canada) asks what the source is for the statement that Fischer had an IQ of about 180. ‘Recently, I spoke to a professor who used to work in the Grade Advisor’s Office at Erasmus Hall while Bobby was a student there. The above position arose after 1 Nc3 g6 2 e4 c5 3 Nf3 Bg7 4 d4 cxd4 5 Nxd4 Nc6 6 Be3 d6 7 Bc4 Nf6 8 f3 O-O 9 O-O Bd7 10 Qd2 a6 in the rapid game Shipman v Fischer, New York, 1971. 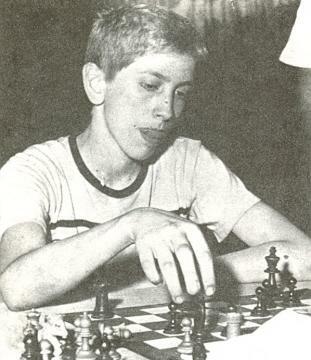 See, for instance, pages 318-319 of volume three of Bobby Fischer (Madrid, 1993). 1 e4 c5 2 Nf3 Nc6 3 d4 cxd4 4 Nxd4 g6 5 Be3 Bg7 6 Nc3 Nf6 7 Bc4 d6 8 O-O O-O 9 f3 Bd7 10 Qd2 a6 11 a3 Rc8 12 Bb3 Kh8 13 Rad1 Kg8 14 Nd5 Nxd5 15 exd5 Ne5 16 Rfe1 Nc4 17 Bxc4 Rxc4 18 b3 Rc8 19 a4 (‘P-KR4’) 19...e5 20 dxe6 fxe6 21 c4 Be5 22 f4 Bxf4 23 Bxf4 e5 24 Bh6 exd4 25 Bxf8 Qxf8 26 Qxd4 Rc6 27 Rf1 Bf5 28 b4 Qc8 29 Rc1 Be6 (‘P-R3’) 30 b5 axb5 31 axb5 Rc5 32 Qxd6 Bf5 33 Qe7 Rxc4 34 Rxc4 Qxc4 35 Qxb7 Bd3 36 Qb8+ Resigns. Source: The Sun (New York), 1 January 1903. 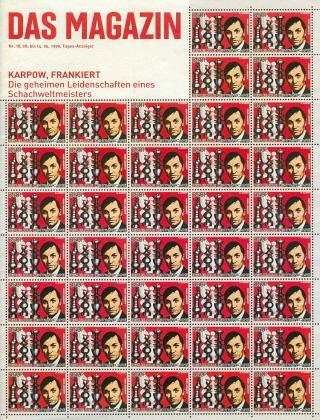 The opening (a ‘Rauzer Sicilian’) is to be noted. As indicated in the game-score above, at two points our correspondent has amended the moves given in the Sun, to make sense of the ensuing play. 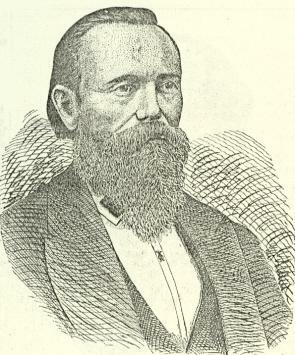 For Black’s name, the newspaper report had both ‘Barshell’ and ‘Barshall’. The details we have incorporated in the game heading come from page 47 of Columbia University Alumni Register 1754-1931 (New York, 1932). His identity is confirmed by the report on the tournament in the New York Times, 30 December 1902. 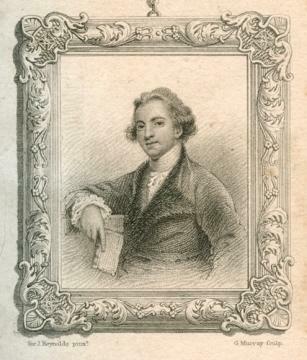 ‘Pierre-Charles Fournier de Saint-Amant’ is the most commonly seen version of the master’s full name, but equally respectable sources have ‘Fournié’. 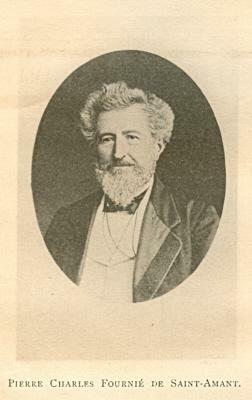 For example, whereas ‘Fournier’ was used in his obituary (La Stratégie, 15 December 1872, page 354), ‘Fournié’ appeared in a biographical article by William Wayte on pages 49-50 of the February 1892 BCM (accompanied by the illustration below). Daughters: Theodora (‘Theadra’) E. (13); Alice May (10); Louis P. (7). Any details regarding Theodora will be particularly appreciated, since we possess a private letter written by her. Pages 36-37 of the book referred to in C.N. 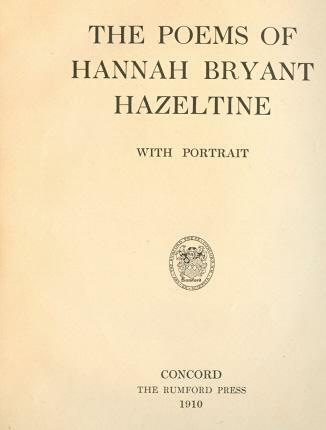 5456, The Poems of Hannah Bryant Hazeltine, had a composition headed ‘Fanny (1863) (An infant daughter who died 26 May 1863)’, and pages 38-39 presented the poem ‘Affliction’, in memory of another of the couple’s children who died young (James Bryant, on 9 May 1867). Javier Asturiano Molina (Murcia, Spain) mentions that a figure of 184 was given, without substantiation, in two books by Pablo Morán. 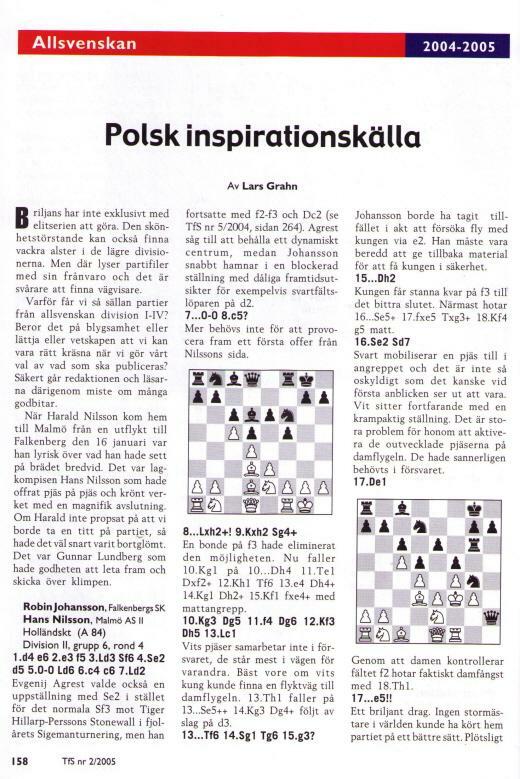 See the inside front cover of “Bobby” Fischer su vida y partidas (Barcelona, 1971/1972) and page 94 of Los niños prodigio del ajedrez (Barcelona, 1973). 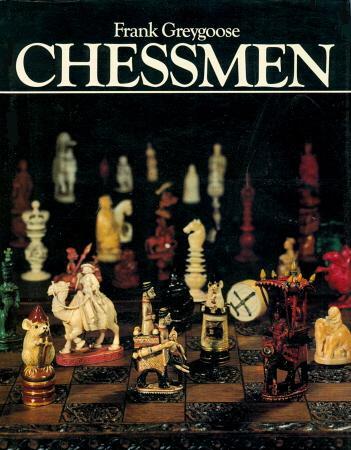 That appeared in the blurb of his book Chessmen (London, 1979). 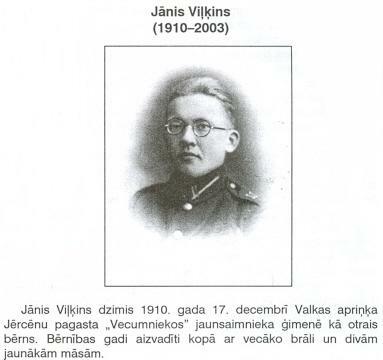 Can a reader provide a note on him and/or his collection? 1 e4 e5 2 f4 exf4 3 Nc3 Qh4+ 4 Ke2 Nc6 5 d4 d5 6 Nxd5 Bg4+ 7 Nf3 O-O-O 8 Kd3 f5 9 Nxh4 fxe4+ 10 Kxe4 Bxd1 11 Bd3 Re8+ 12 Kxf4 Bd6+ 13 Kg5 h6+ 14 Kf5 Nxd4+ 15 Kg6 Bxc2 16 Bxc2 Nxc2 17 Rb1 Ne7+ 18 Nxe7+ Rxe7 19 Nf5 Re6+ 20 Kf7 Kd7 21 Nxd6 cxd6 22 Bd2 Rhe8 23 Rbc1 R8e7+ 24 Kg8 Drawn. They are usually dated circa 1933. In the case of the second game see, for instance, pages 86-87 of Paul Keres Chess Master Class by Y. Neishtadt (Oxford, 1983). 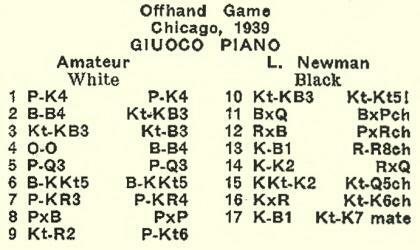 A position from a third game between the two players was given on page 207 of the July 1935 issue of the German magazine. 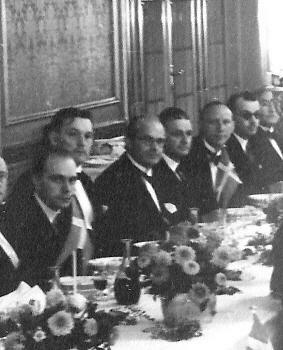 This group photograph (Copenhagen, August 1934) was published on page 318 of Schackvärlden, September 1934. It was taken seven months before Nimzowitsch died, and we wonder whether it is the last picture of him. ‘Most errors in analysis arise through taking something for granted. In chess, you must always be taking something for granted, or you could hardly ever come to a decision at all – hence the inevitability of error. On move 7, Alexander has assumed as a matter of course that the white king will take the opposition. We are all taught that the opposition is the great desideratum in pawn endings. 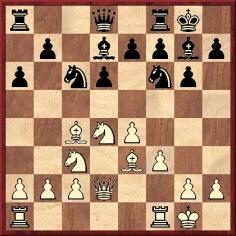 The trouble is that every generalization in chess breaks down – sometimes. 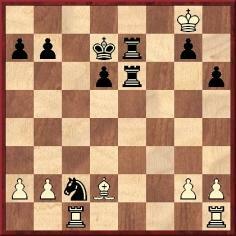 Here White can win by deliberately giving Black the opposition, temporarily. Thus, 7 K-K5! 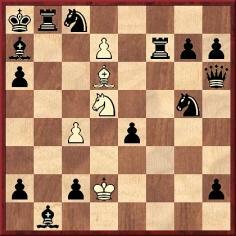 This enables White to force the win of the black pawn and win easily, e.g. 7...K-N2 8 K-B5 K-B2 9 P-N6ch, etc. Or 7...K-K2 8 P-N6. 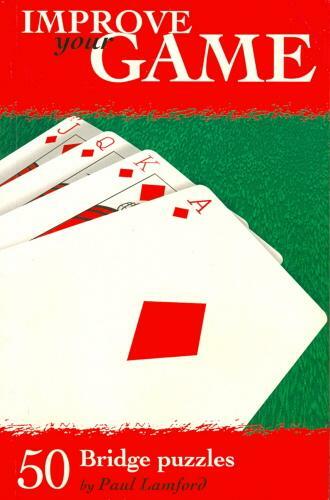 After 7 K-B5 K-N2 the book says White has “nothing better” than 8 P-N6. 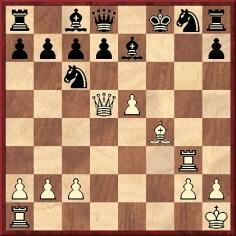 This, again, is wrong; with a little shuffling, White can “change the move” and still win, e.g. 8 K-K5 K-B2 9 K-Q6 K-N2 10 K-K7 K-N3 11 K-K6 K-N2 12 K-B5, etc. 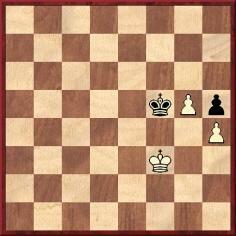 Indeed, with the pawns as diagrammed, White can win no matter where the kings are. 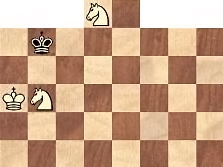 But in the diagram, if you move all the pawns [and the kings, of course] one rank or two ranks nearer to Black’s side, then it really is a draw. Here we have two paradoxes: (a) that taking the opposition on move 7 is bad, (b) that if White is nearer queening he is worse off. Both paradoxes arise because of the law of stalemate, which is itself paradoxical. It seems that Purdy’s correction did not come to Alexander’s attention, for the faulty solution still appeared on page 105 of the final edition of his book, Alexander on Chess (London, 1974). A mirror image of the same pawn ending (demonstrated as a win) was given on page 42 of volume four of Comprehensive Chess Endings by Y. Averbakh and I. Maizelis (Oxford, 1987). 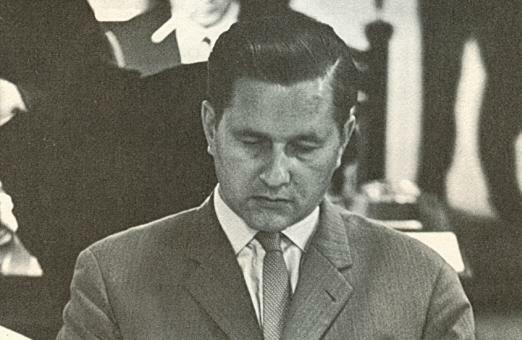 Source: Chess Review, May 1961, page 137. ‘In the new dorms which face each other across a quadrangle on the Berkeley campus, men and women students at the University of California found a ready-made gambit for getting acquainted. 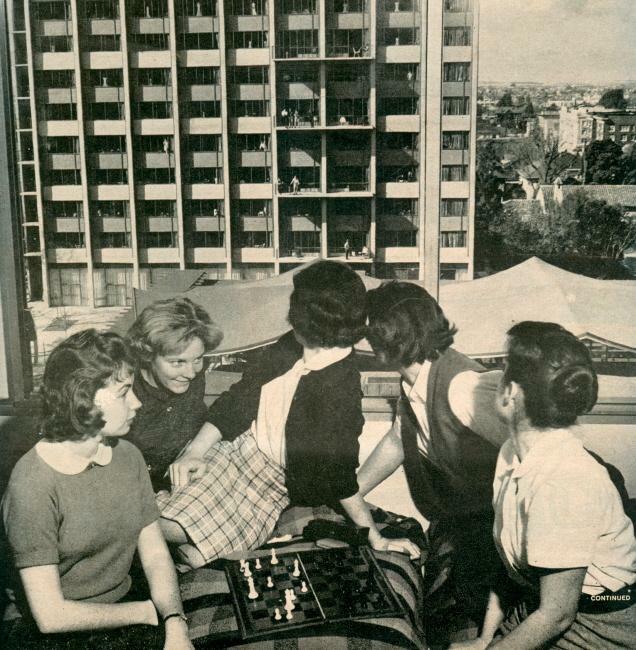 The 64 windows of the eight-story buildings made perfect 64-square chessboards. Cutting yard-high chessmen out of cardboard, the men set up an eight-story-high game in their windows and sent a challenge to the girls. It may be wondered whether there has ever been a larger chess ‘board’. 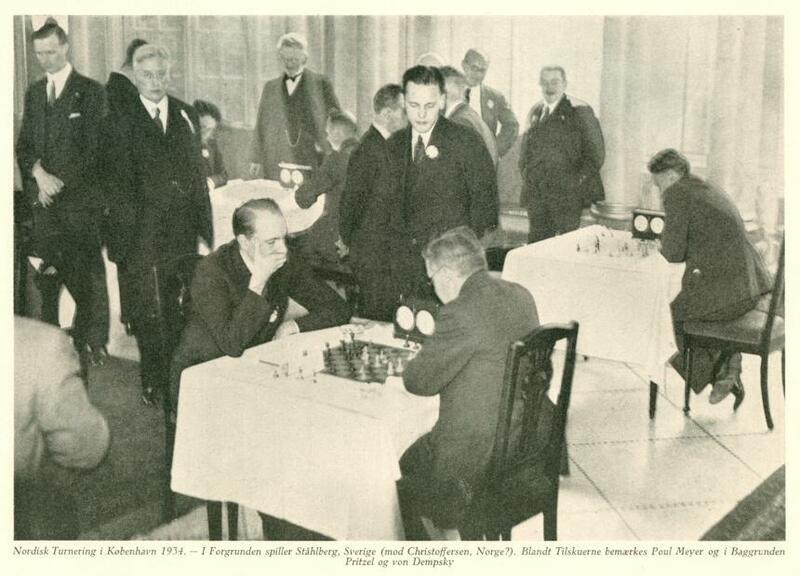 ‘The picture published in Schackvärlden in 1934 is surely one of the last of Nimzowitsch – but not the last. 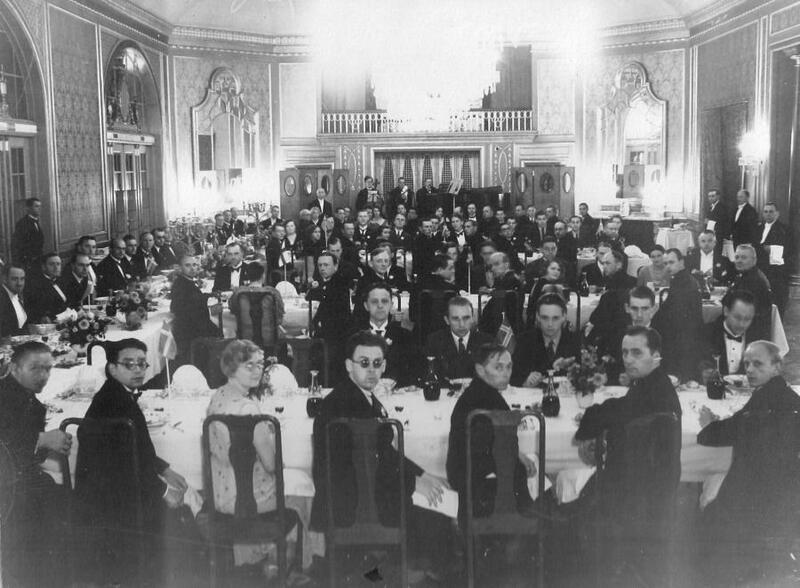 The distribution of prizes took place before the banquet (as reported on page 319 of the Swedish magazine), and it may be assumed that the picture in C.N. 5478 was taken on that occasion. 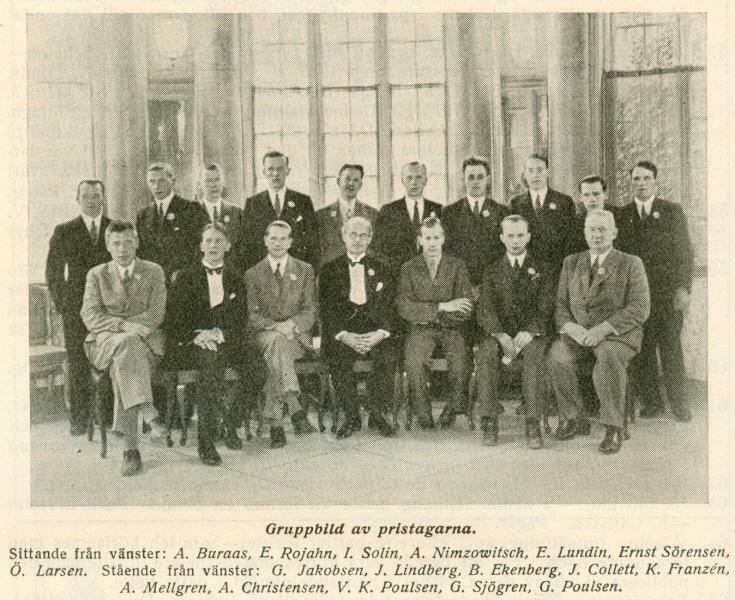 The caption reads: “Gruppbild av pristagarna” (Group photograph of the prize-winners). ‘One day when there was no matinee I ducked out and went looking for some kind of action. In front of a good-sized theatre, one I hadn’t been in yet, there was an unusually long line of people. The line wasn’t moving. No tickets were being sold. It had to be something sensational with this many people waiting for a chance to get in. Since the day I bought my outfit at the government store I had become used to the idea that foreigners didn’t stand in line. I went up to the box office and waved a dollar bill in the window. The cashier grabbed the buck and gave me a ticket. Valootye – foreign currency – worked like magic in Moscow. The house was packed, and noisy. Most of the audience were standing or walking around, chatting, drinking and eating. Others were sleeping or reading. I had apparently come in during the intermission. Yet the curtain was raised and the stage was lit. Oddest of all was the setting on the stage. There was a small table and a chair. On the table were two telephones, and a bunch of knickknacks. Behind the table was a large, tilted mirror. It was the longest intermission I ever sat through. Fifteen minutes passed. Twenty minutes. Twenty-five. Nobody seemed to mind waiting that long for the next act. Then a buzzer sounded. People damn near trampled each other to get back to their seats. In 30 seconds the theatre was silent as a tomb. Everybody was watching the empty stage. A boy, maybe ten or eleven years old, walks out from the wings. He sits at the table. He picks up the receiver of one of the telephones. He listens for a while, then hangs up without saying anything. He moves one of the little props on the table. The joint is so quiet I can hear my wrist watch ticking. The boy moves another knickknack. A guy comes out, walks to the footlights, announces something to the audience, and the joint goes wild. People jump to their feet. They yell and throw their hats in the air and embrace each other. The guy who made the announcement shakes hands with the boy and the cheers are deafening. This is absolutely the craziest show I ever saw. Finally it dawned on me what I had been watching. A chess match. Can readers provide any information? Our correspondent notes that Nimzowitsch is standing in the background. He also suggests that, in the photograph in C.N. 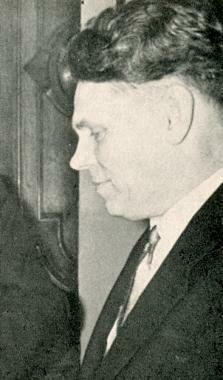 5482, the second person to Nimzowitsch’s right is Gideon Ståhlberg. 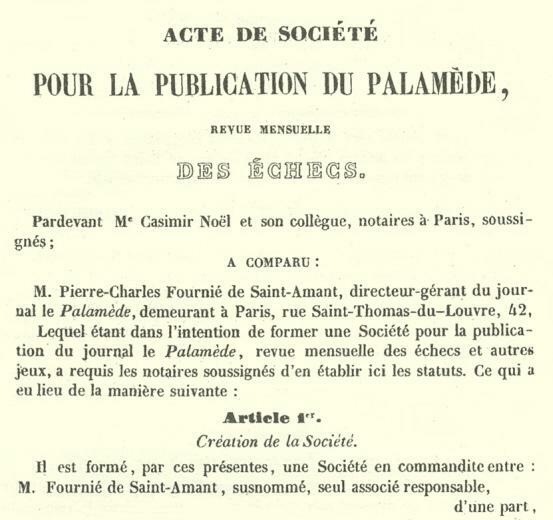 ‘What is the origin and history of the expression “j’adoube” as applied to chess? What historical evidence exists for these assertions? More generally, we shall appreciate any hard facts from readers on ‘J’adoube’ – or ‘J’Doube’ to borrow the spelling on page 2 of How to Play Chess Like an Animal by Anthea Carson and Brian Wall (Colorado Springs, 2007). The Small Chess Dictionary by Y. Averbakh (Belgrade, 1980) gave, on page 35, поправляю in Russian and Popravljam in Serbo-Croat. Some ironic advice concerning ‘J’adoube’ was quoted in Land and Water of 28 June 1873 from the Liverpool Weekly Albion. See C.N. 54 (page 375 of Kings, Commoners and Knaves). In addition, a ‘j’adoube’ anecdote from Vienna, 1908 was reproduced from the American Chess Bulletin on page 313 of A Chess Omnibus. Endgame Virtuoso Anatoly Karpov by T. Karolyi and N. Aplin (Alkmaar, 2007). This was written by Harold C. Schonberg in an article entitled ‘Fourteen-year-old “Mozart of Chess”’ in the New York Times, 23 February 1958. 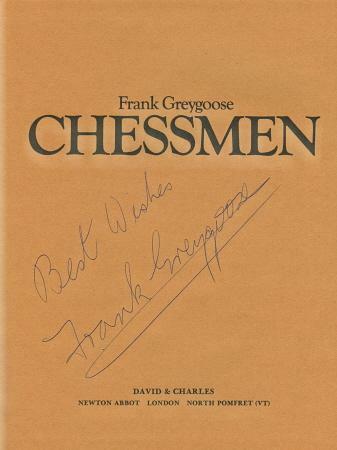 See page 51 of The Joys of Chess by Fred Reinfeld (New York, 1961), which reproduced the article. 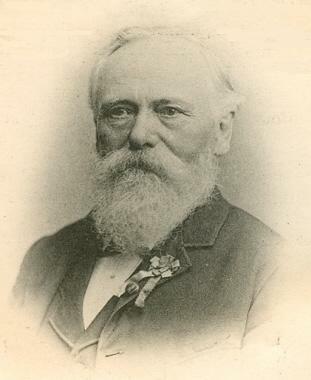 John Townsend (Wokingham, England) notes that the Huddersfield College Magazine was incorrect to state that Staunton’s column in the Illustrated London News began in 1842, the right date being 1845. In George Walker’s A New Treatise on Chess (London, 1833), pages 16-17, the requirement to say “J’adoube” is given similarly as in Sarratt, but Walker states that it is “an obsolete expression, signifying ‘I adjust’ or ‘I replace’”. Paul Dorion (Montreal, Canada) notes that the French verb adouber is quite commonly seen nowadays when, for instance, a politician endorses a potential successor. Recent news headlines include ‘Bush adoube McCain’ and ‘Poutine adoube Medvedev’. Our source names only two of the figures in this photograph.